My smile this week is summed up with these THREE smiles! So very blessed this past weekend to do several events with my co-author, Angela Breidenbach. Here we are with my daughter Hanna (our cover designer) who hosted a Snowflake Tea for us at her church. 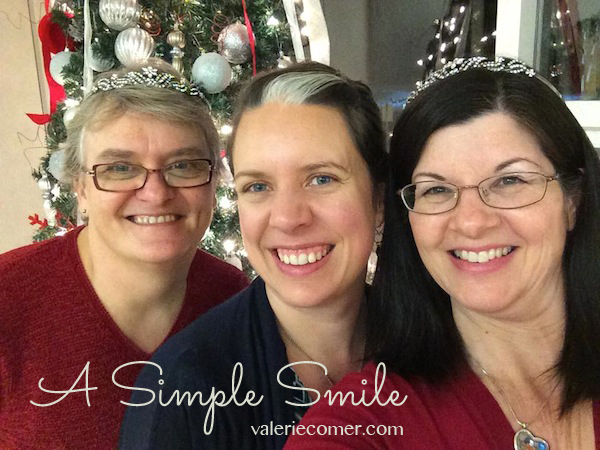 Why, yes, Angela and I *did* wear our tiaras at all our Snowflake Tiara events this weekend! This Tea sounded so inviting. I did have another event I was hosting. I may be interested in hosting a Tea for you two gals in 2015. Debbie, we’d definitely be interested in talking about it! Your teas are lovely.